It was 14 years ago that Lahey Hospital & Medical Center began offering palliative care — comfort care for people with life-limiting illnesses. “We were one of the earliest programs in the Boston area,” noted Dr. Elizabeth Collins, who directs the hospital’s Palliative Care Program. “That tells you a lot about our patient- and family-centered philosophy. 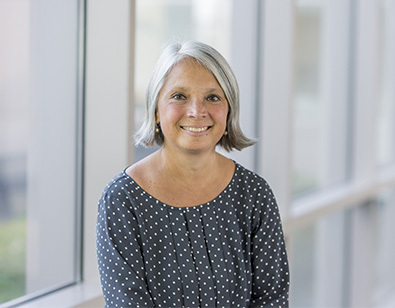 Palliative care offers that hard-to-find ‘Marcus Welby, MD’ personalized relationship for our sickest patients.” It is a growing need at the hospital, which in 2017 saw more than 900 new palliative care consults for inpatients. 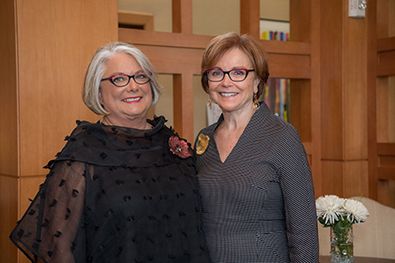 In 1992, an early member of the Women’s Leadership Council (WLC), Betsy Harpley, established a palliative care fund in memory of her husband. The Theodore Raymond Harpley Endowment Fund aids cancer patients who need help funding end-of-life care services and disburses more than $70,000 in grants a year. The WLC’s vision is that any patient who comes to Lahey Hospital & Medical Center will have the opportunity to improve end-of-life experiences for themselves and for their families. 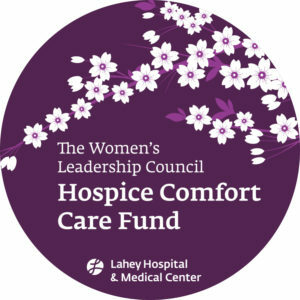 A modest, need-based grant of $1,500 from the newly established WLC Hospice Comfort Care Fund would enable families to afford supplemental help in their homes or care at a hospice facility. The hospital’s case management staff and social services professionals will identify candidates for the fund and recommend grants — there is no application process. 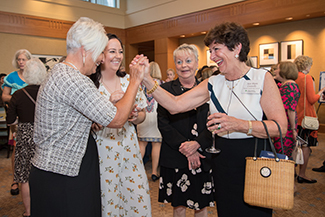 Agreeing with Cindy was another WLC volunteer, Gretchen Fox Stein, who immediately matched Cindy’s gift to launch the fund. 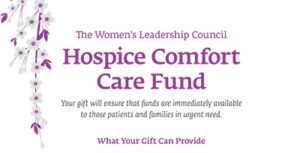 The Hospice Comfort Care Fund will be the WLC’s forever legacy, there in perpetuity to help ease end-of-life care and transitions for patients and their loved ones. Attend the annual Ladies’ Night Out each year. Funds raised at this event support the Hospice Comfort Care Fund. Learn from the WLC archive of lectures. Contact us about WLC volunteer opportunities or board and committee membership. Use the form below to make a gift from your Donor-Advised Fund. Hospice Comfort Care Fund here. The fund will be administered by the Director of LHMC Palliative Care Services and can be used to support supplemental end-of-life care for qualified patients in a variety of settings including home, hospice, and long-term care facilities. Questions? Read our FAQs to learn more. All proceeds benefit the Hospice Comfort Care Fund!